Bush is currently enjoying a surge in popularity. The second Bush, not the first. 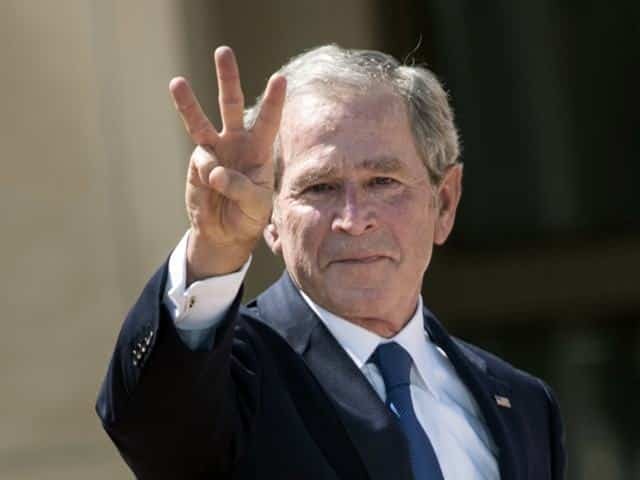 He’s the one who got us into Iraq and oversaw the Katrina disaster. Anyway, there are lots of people saying very nice things about him. And for good reason, I think. I think the guy has a genuinely good heart, and that he was honestly trying to do the right thing in most cases. That’s just my opinion. I think the key ingredient here is contrast. When you swing so wildly in various ideological and policy directions, it’s easy to realize how good you had it before. And when it swings the other way you get more hot and cold feelings in different parts of your body. It’s like repelling near an erupting volcano and then diving into an ocean full of icebergs. The body doesn’t know how to properly measure and think about the inputs because it’s too busy being shocked. And then you have people who are the ice and the lava, and can’t stand anything that doesn’t match. Today, people who hate Bush will talk about how great he is and people who loved Bush will talk about how horrible he is. Then you have the people who see my point here, and realize that better than Trump doesn’t equate to good. Like any president, he wasn't all bad but the Strange New Respect for George W Bush that Trump has inspired is pretty crazy. As I talked about in Exploring the Nature of Evil, it’s not easy to say who’s good and bad, especially when you’re dealing with great people who yield great power. But all things being equal, I think Bush was a better person than Trump, and that I’d perhaps rather have his negatives than Trumps. And that’s what it comes down to. You have a collection of horrible, and a collection of strengths, and you have to weigh the two, which are different for most people.